One of my favourite parts of the Christmas season are the festive scents that fill the house. The fresh pine aroma of the tree, the warm vanilla-spice scent of my favourite winter candle and all the wonderful smells that happen in my kitchen. Now is the time where most of us don’t mind giving it a little bit extra in the food department. And frankly, with it being mostly dark and wet outside, it is the perfect month for gathering friends and family round the table for big knockout feasts. 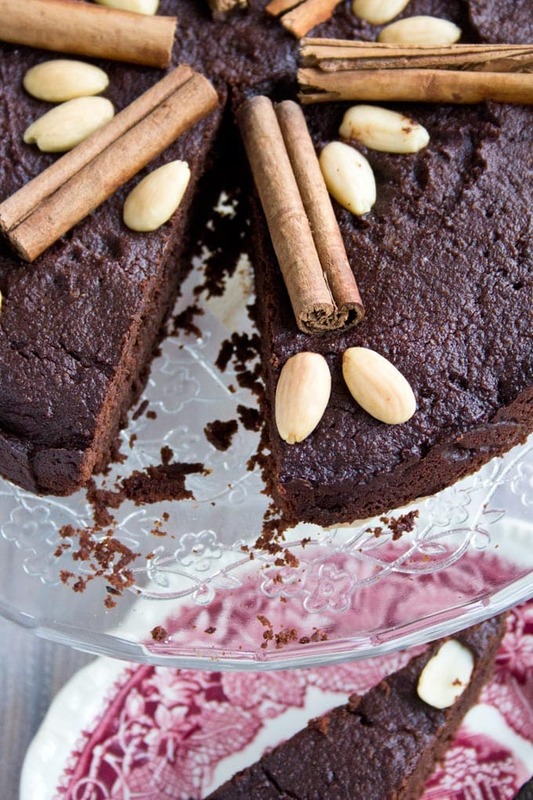 Enter this deliciously spiced chocolate Christmas cake! 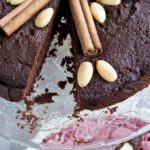 If you’re in for a rich, indulgent treat, this spiced flourless chocolate torte will make you very happy indeed. Tortes are naturally gluten free, because they are made with ground nuts instead of wheat flour. This recipe uses ground almonds (you can use either almond meal or regular almond flour – not the extra fine kind). Because it contains a mother-load of dark chocolate, butter and cream, it is deliciously moist. I used chocolate with 90% cocoa solids, so the sugar content of the chocolate calculated per slice is very low. If you want, you could use unsweetened chocolate instead and increase the amount of erythritol by 2-3 tbsp. In the UK Montezuma is a good option, in the US you could go for a quality brand such as Ghirardelli. 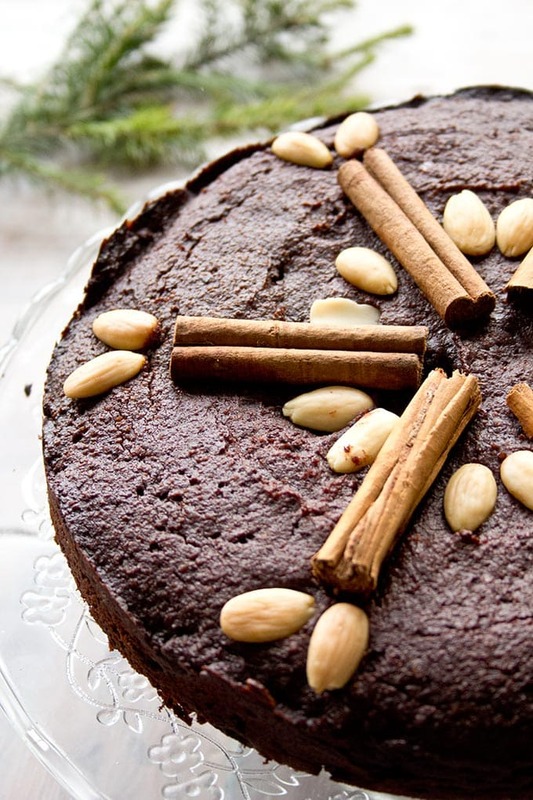 This chocolate Christmas cake recipe is sweetened with a mixture of dates and erythritol. I haven’t used dates in a while because they do have a high sugar content, but let’s not forget that this is a natural sugar which absorbed less rapidly than table sugar. Dates have other health benefits, which you can read about in this post on my sweet potato brownies. They also give the torte a delicious caramel note. Traditional Christmas cakes are laden with dried fruits such as currants, which are very high in fructose. I find that the dates are a good stand-in this recipe for providing that Christmas taste whilst keeping your blood sugar levels in check. The cake provides 16 portions as it is very dense, which works out at 1/2 a date per slice (I used 8 dates in total). Because of the dates, this chocolate cake has a higher net carb count (8.3g per slice) than my usual cake recipes. 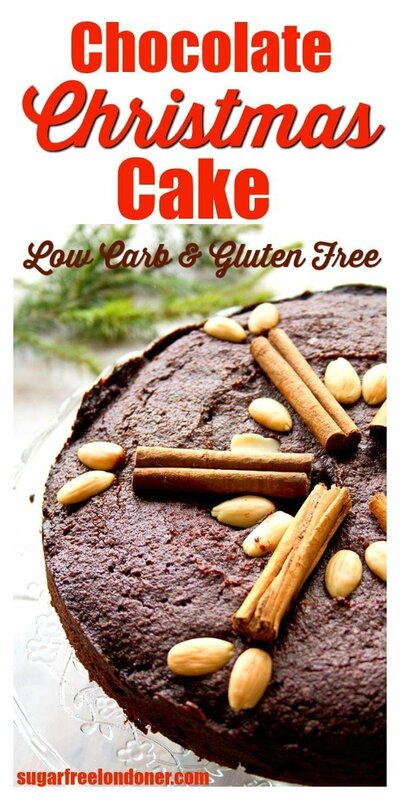 If you prefer to keep your net carb count lower, you can make this cake Keto by omitting the dates and adding more erythritol (adjustment amounts and new carb count are in the recipe notes at the end of the post). 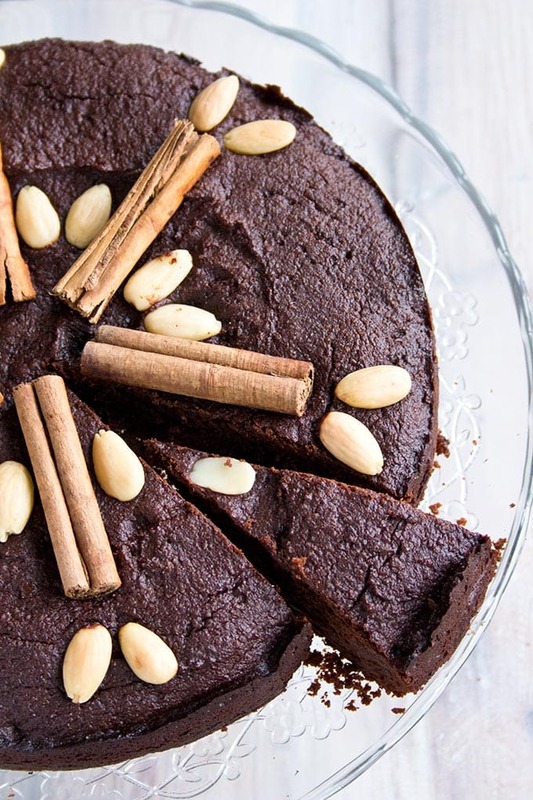 The best thing about this flourless chocolate torte are the spices. The scent of cinnamon, cardamom and cloves that fills the house when you bake is just mouthwatering. I always find it incredible how such a tiny amount of cloves (1/4 teaspoon) can be so intense. These spices really are the heart and soul of the torte – don’t leave them out! Top Tip: You can add 1 tbsp of orange zest and 1-2 tbsp brandy to the cake batter to take the Christmas cake flavour to the next level. I actually also added vanilla into my chocolate Christmas cake, but have not included it in the ingredients below. To be honest, I could not taste it at all – the chocolate and spices are just too intense. Let’s save your vanilla extract for another beautiful sugar free dessert such as my healthy almond berry cake. A naturally sweetened chocolate Christmas cake that will knock your stockings off! 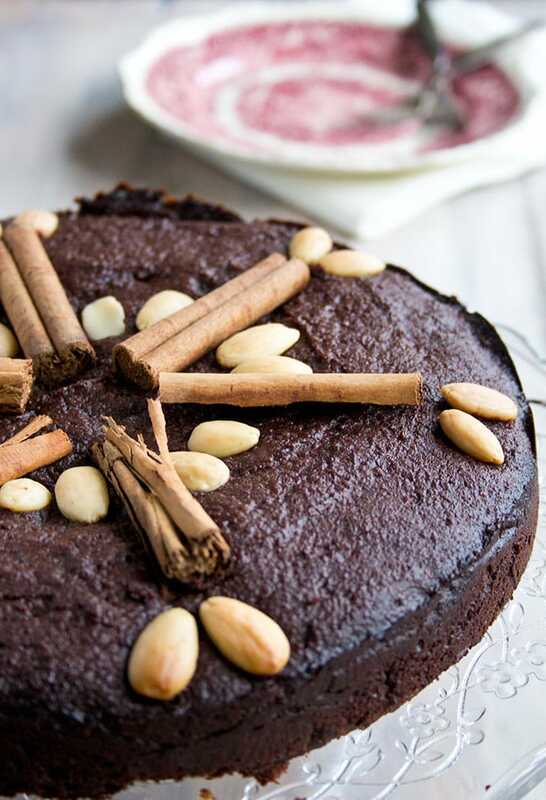 Deliciously spiced with cinnamon, cardamom and cloves, this flourless chocolate torte is perfect for the holiday season. Melt the chocolate and butter in a non-stick pan or in the microwave. Mix the egg yolks and sweetener, then add the dates, the black cardamom kernels (not the shells), cinnamon, cloves plus the melted butter-chocolate mixture. Add the almond flour (or ground almonds), baking powder and cream and mix until you have a smooth dough. Pour into your springform, decorate with cinnamon sticks and almonds and bake ca 40 minutes until the cake is cooked but still a little gooey in the centre. Remove from the oven and let the cake cool in the tin. If you wish, you can replace the dates with another 4 tbsp of erythritol and reduce the amount of almond flour by 1/2 cup / 50g. This changes the total carb count to 4.7g, the net carb count to 3.6g and the sugar to 1.7g per slice. You can add 1 tbsp of orange peel and 1-2 tbsp brandy to the cake batter to take the Christmas cake flavour to the next level. This post was first published in December 2016. It was updated with more details and recipe variations in December 2018. Hiya, I have questions. I am fairly new to LCHF baking. So the only almond flour i have seen has been the superfine type. Ground almonds, do you mean a paste? Hi Dottie, here in the UK supermarkets sell ground almonds which is coarser than superfine almond flour. This could be comparable to almond meal in the US. Or, indeed, some almond flour brands which do not call themselves superfine. Check out your non-branded supermarket-own almond flour, for example. It’s not a paste. This torte sounds terribly decadent! I’m one of those people who loves spice in my desserts in the fall and around holidays and dates lend such nice warm flavor and moistness. I bet it’s stellar. I love your use of dates in this recipe! I can already smell the spices! That looks so moist and delicious!!! Thank you Georgina, is really is super-moist… and unfortunately gone already! I love that this has dates but is still low carb with dense fudgy goodness.